*NEW AUDIO BOOKS* - BookView Cafe have just published two new audiobooks. The Aunt Paradox and The Unpleasantness at Baskerville Hall are both available now from Audible, Amazon and Apple. Both books are narrated by Paul J Rose, who narrated the first book in the series - What Ho, Automaton! "This made me laugh, as is usual with Bertie & Jeeves, and captivated as I listened for resolution of the familiar mystery(s). Well written, imaginative, and witty, and the performance was impeccable." 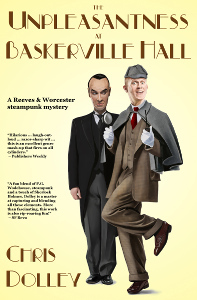 "Jeeves and Wooster meet Holmes and Watson with a touch of steampunk in the hilarious first full-length Reeves and Worcester tale.... This laugh-out-loud parody works on several levels.... With razor-sharp wit and fast pacing that plays fair with the reader, this is an excellent genre mash-up that fires on all cylinders." He's the man who moved to France with too many animals and an identity thief. French Fried chronicles the move that saw his identity stolen, his life savings seized and how, abandoned by the police forces of four countries, he had to solve the crime himself. Which he did in one of the most bizarre and comical investigations ever. He was one of the first computer games designers, writing the most aggressive chess program ever and inventing the most dangerous game ever played - the Giant Wrigley's Spearmint Gum Cliff Top Relay. See Confessions of a Pioneer Computer Games Designer for the complete story. His novelette, What Ho, Automaton!, was a finalist for the 2012 WSFA award for short fiction. Don’t step on the cracks - everyone knew the sense of that. One of the first things you learned as a child. But too many people forgot. Or didn’t care. Graham Smith cared. He knew that paving stones set the cadence of a street; that cracks regulated the stride length and set the resonance that kept everything stable and harmonious. Step on the cracks and the street slipped out of kilter. Imperceptibly at first. Minute changes around the edges, a new person living at number thirty-three, a strange car outside number five. Step on the cracks too often and … well, anything could happen. He’d seen houses turned into blocks of flats overnight. Parades of shops come and go. Terraces demolished, office blocks erected. All overnight when no one was looking. The world was a far more fragile place than people realised. And every now and then a thread would work loose and something or someone would unravel. Imagine a world where there's more than length, breadth and depth. Where there are other axes of movement. A true eleven-dimensional universe. And then throw in a discovery that the human brain protrudes into these higher dimensions. Welcome to the world of SHIFT. A multi-dimensional thriller where the detective has to get inside the mind of a killer - the hard way. Magical Crimes is a fun CSI with magic and ‘a little something else’ story. The little something else being two foot long and lurking in the hero’s trousers. But don’t worry, the boinkwurst in this story is used purely for the purpose God intended – humour and crimefighting – not lustful titillation. Seb Kemp is a psychic profiler with a problem. After a night out drinking some men wake up with an unexpected tattoo. Seb woke up with a floor-length boinkwurst and no memory of how, when or where it happened. To make matters worse, magic doesn’t work well with living tissue. The results are unpredictable. The spell might fade after a few days or ... something might drop off. He needs help but, Pete, his forensic magician partner, is 3,000 miles away working on another case and Seb’s new partner is of the young and female persuasion. Not to mention extremely hot. The two of them are thrown together to solve a high profile locked room mystery where the utmost tact and diplomacy is required – not easy for a man with unpredictable trousers. Then they’re abandoned by the police forces of four countries who all insist the crime belongs to someone else's jurisdiction. The French say it’s an Irish crime as that’s where the money was held. The Irish say it’s French as that’s where all the correspondence came from. The British say it’s nothing to do with them even though forged British passports were used to open the bank account in Spain. And the Spanish are on holiday – and can’t even think about investigating any bank account for at least four weeks. 2012 WSFA Award finalist. What Ho, Automaton! chronicles the adventures of Reggie Worcester, gentleman consulting detective, and his gentleman's personal gentle-automaton, Reeves. Reggie, an avid reader of detective fiction, knows two things about solving crime: One, the guilty party is always the person you least suspect. And, two, The Murders in the Rue Morgue would have been solved a lot sooner had the detective the foresight to ask the witnesses if they'd seen any orang-utans recently. Reeves needs all his steam-powered cunning and intellect to curb the young master's excessive flights of fancy. And prevent him from getting engaged. The book contains two stories set in an alternative 1903 where an augmented Queen Victoria is still on the throne and automata are a common sight below stairs. Medium Dead is a fun urban fantasy chronicling the crime fighting adventures of Brenda – a reluctant medium – and Brian – a Vigilante Demon with an impish sense of humour. Think Stephanie Plum with magic and a dash of Carl Hiaasen. He's also reckless – his last partner died during one of his takedowns. Along the way, Brenda discovers that Brian isn't as old, or as powerful, as he led her to believe. He might even be human. Whereas the murderer they're hunting, and the child he's holding prisoner, might not. A quirky murder mystery set in rural England charting the descent and rise of a detective on the verge of a nervous breakdown. Peter Shand is the 'safe pair of hands' – a high-flying police administrator seconded to a quiet rural CID team to gain the operational experience he needs for promotion. On his second day he’s thrust into a high-profile murder case. The pressure on Shand is enormous. The case is baffling. He can’t sleep, a local journalist is out to discredit him, and then, goaded at a press conference about lack of progress, he invents a lead. And keeps on lying – to the press, his boss, his team – telling himself that he'll solve the case before anyone finds out. And then another murder occurs. And had there been a third? But which will break first? The case, or Shand? Sequel to the WSFA Award finalist What Ho, Automaton! Guy Fawkes is back and this time it’s a toss up who’s going to be blown up first – Parliament or Reginald Worcester, gentleman consulting detective. But Guy might not be the only regicide to have been dug up and reanimated. He might be a mere pawn in a plan of diabolical twistiness. Only a detective with a rare brain – and Reggie’s is amongst the rarest – could possibly solve this ‘five-cocktail problem.’ With the aid of Reeves, his automaton valet, Emmeline, his suffragette fiancée, and Farquharson, a reconstituted dog with Anglican issues, Reggie sets out to save both Queen Victoria and the Empire. The hilarious new spoof diet book from New York Times bestselling author, Chris Dolley. It’s a fun, quick read (about one hour) covering everything from ‘the science of possession’ to ‘Crapper Clinic’s Demon Dating Service’ that ensures clients are possessed by the demon most compatible with their slimming needs. This is the diet book that everyone is talking about. Some of you may have read about the clinical trials undertaken by Stepford University – one of the leading universities on the PLANET with more likes on Facebook than Harvard and SIX times that of Stanford! The Possession Diet is the ONLY diet guaranteed 110% effective by the FDA (Federal Demon Association) ... and it’s ALMOST NEVER FATAL!